Stress, in its simplest definition, is that which takes more energy than you can provide. It can include an especially condensed workload in the office, or it can involve the silent tension in your marriage. Maybe it’s a belligerent teenage child who barely talks to you, or it could even be a part of your identity that you’re looking to build on but haven’t yet been able to. Stress can crop up in virtually any arena in your life, but there’s one form of stress that seems to cut through the rest: deadlines. 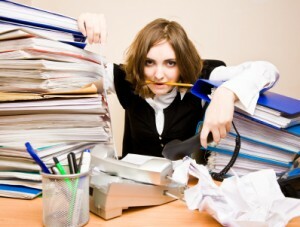 Nothing is clearly more evocative of stress than having to do a certain amount of work in a certain amount of time. You could be a writer who has to finish the first draft of her novel in 4 months. Or you could be a CEO who has to make a certain progress report to the board of directors in 1 week. This is when the targeted effect of hypnosis fits perfect for the targeted goal of having to make a deadline. There’s nothing wishy-washy about a deadline, and there’s certainly nothing wishy-washy about hypnosis. If you have an important deadline; whether it’s in one week or one year, an immediate hypnosis session will help reduce anxiety, increase performance levels and focus, build on the interpersonal skills that will help you attain your goals, and give you the emotional foundation and optimism to fuel your success. The job of hypnosis will not be to get rid of the stress—as I indicated above, stress is everywhere—the key is to help you get through the other side of a stressful situation in a happy and healthy way. This entry was posted in hypnosis anxiety, stress remedies and tagged anxiety, stress by Dr. Errol Gluck. Bookmark the permalink.